Today’s sports families are always on the go and carry so much stuff to their young athlete’s games. You always want the ability to capture those memories in photographs, but is it really necessary to carry your bulky professional camera to every event? To lighten the load, how about leaving that big, bulky camera home and utilize the one you already have tucked away in your pocket, your camera phone. Now it's worth stating that you’ll never get the same results as you would with a high end camera; but the convenience of having a camera readily available at anytime is a tool worth having. So why not learn to get all you can out of this awesome piece of technology? Some of the drawbacks to using your phone’s camera in these situations will be zoom distance, motion blurring, and lighting, but have no fear because we are here to provide you with some easy-to-follow tips that are sure to make your cell phone photos turn out better than ever! For this task, we worked with our expert sports photographer here at Upward Sports to compile these 10 easy tips to help you capture your child’s game days like a professional! Set resolution and picture settings to "High." Get the most out of your camera! Photos at these settings will be larger files, but this will provide you with the best images and make it possible to enlarge them without much distortion. Use the provided tools on the phone. Grid – Divides your potential image into horizontal and vertical thirds. Place important elements along these lines and at intersections for better pictures! Exposure Lock – Allows you to find the light exposure you like, and lock it in for other photos. This is extremely helpful in low light situations! Burst Mode – Allows you capture a consecutive set of photos (up to 10 photos per second). Perfect for capturing an athlete in action! Filters – Uses color and styling effects. If possible, always keep the light to your back as to keep your subject well lit. Be aware of your light levels because as you lose light, your photos will become more distorted and an overall lesser quality. Using the digital zoom will make it difficult for the camera to focus, distort the lighting, and increase the image’s graininess and pixilation. Minimize the clutter in the frame. Keeping targets in your photos to a minimum will allow the lens to focus correctly and give you the highest quality photos. Camera phones often don’t handle fast-paced action photos very well, thus resulting in “motion blur." Try anchoring your hands and elbows on something (the ground, a tree, the bleachers) or invest in a small tripod. Even then, try to stay steady, and avoid quick movements once in focus! Take several of the same shots. Having digital photographs allows you to make mistakes. So to ensure you get the best shot, always take multiple photos, and wait until you get them loaded onto a properly sized screen before you erase them. Try different angles (High, low, etc.). Sometimes with a camera phone, you're unable to capture the atmosphere or intensity like you would with a normal camera. To combat these deficiencies, be unique; create your own shot! Use different angles, heights, and vantage points to create your own unique shot. With your phone always in your pocket and bags and being touched with grainy, oily hands, your camera lens is constantly being dirtied; making the potential of taking high quality photos nearly impossible. Make sure, before you start using your camera, to wipe it clean with a microfiber cloth to avoid scratching the lens. Don't be afraid to "touch-up" the photos. Not every shot is going to be perfect! Sometimes a camera phone just won’t have the capability to deal with the conditions you’re in. Luckily, digital photos and photo enhancement software allow you the possibility of making something out of nothing, ensuring that you will always have those special memories captured. 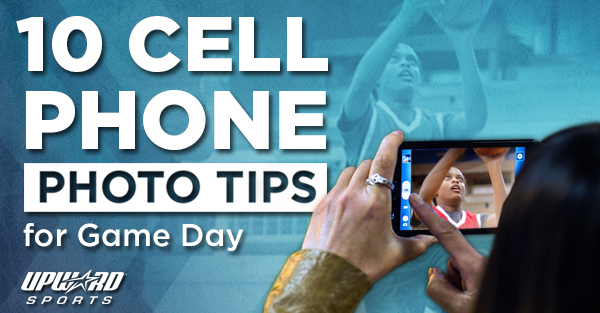 Try these tips on your camera phone next Game Day Saturday, and see the results for yourself. We would love to see your young athlete in action, so share your photos with us on our Facebook Page or use #PlayWithPurpose on Twitter or Instagram.